Most weeks the Broward County Elections Office, nestled in the Lauderhill Mall just off US 441 in Lauderhill, Florida, isn’t the kind of place that draws a crowd. But on Election Day earlier this month, as Bob Henry Sr. stood in the parking lot closest to the county office, what he saw looked like something just short of a mob. The parking lot had become a locus for the frustrated, the distrustful, the accusatory, and the truly angry. “Lock her up,” seemed to have become the day’s favored refrain. The “her” in question was Broward County Election Supervisor Brenda Snipes. This week, after nearly 15 years in office, Snipes announced that she will step down from her post as Broward County Elections Supervisor on Jan. 4. 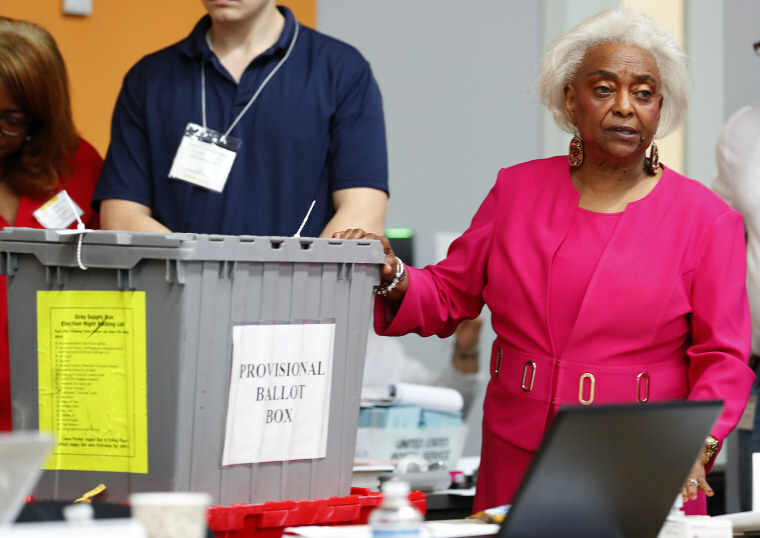 Snipes, an election administrator with a problem track record long before the 2018 midterms, is said to have been deeply troubled by descriptions of her and her staff as something far worse than slow-moving or inattentive to the details key to operating a smooth election. Since Election Day, Trump and other Republicans have described Snipes and her work in ways that have left her the embodiment of the rigged and corrupt American election process about which Trump often warns his supporters. The narrative often coming from Trump’s public statements paints election administrators like Snipes and poll workers as un-American, and U.S. elections in general as a coming together of crooks and nincompoops. Henry observed outside the Elections Office in Broward County a sign that read: “When Snipes counts votes, votes don’t count.” Another read; “Snipes creates fake ballots and destroys real ballots. Prison.” In his column for the Westside Gazette, Henry described Trump's role in recasting Snipes, a woman he first met almost 20 years ago when Snipes was overseeing 16 schools for an area school district, as a silver-haired criminal. And finally, he sent a tweet claiming “large numbers of new ballots” had “showed up out of nowhere,” and others were “missing or forged” preceded one with a direct reference to the “characters running Palm Beach and Broward County,” being unable to “‘find’ enough votes” to presumably change the election outcome. Trump has simply borrowed from a playbook dating back to the period just after the Civil War, Anderson said, referring to a time when black voter involvement in elections began to be described as inherently likely to produce fraudulent outcomes. White Democrats, mostly in the South, often described black Americans as ill-suited to participate in democracy. “I think we can all see that some things are not going well, did not go well. But President Trump’s assertions are not grounded in reality." It's a set of tactics and ideas that have been renewed with gusto. Since 2000, Republicans have embraced the same notions, claiming that voter ID and other measures which tend to restrict minority voter access must be in place to conduct secure elections. Florida election law allows certain types of ballots to be counted after Election Day. This includes votes cast by military personnel serving abroad, provisional ballots and others, Burden said. Trump told The Daily Caller in a Wednesday interview that poll workers may also be facilitating Republican election losses by simply failing to notice repeat voters. Here are the known facts: Snipes, a Democrat appointed to office in 2003 by then Gov. Jeb Bush, a Republican, won the support of Broward County voters in 2004. Area voters continued to re-elect her, most recently in 2016. On Election Day this month, the county’s budget put her in charge of a 74-person staff and a slate of Election Day workers. Snipes predicted that 2018 Midterms turnout would be high — about 60 percent of Broward’s electorate. And, she asked for and received about $18.93 million in county funding for elections that will be conducted during fiscal year 2019. That represents a 2 percent budget increase over the previous year, one of the smaller among Broward’s major departments. Snipes and her staff have acknowledged a series of errors before and after the midterm election. That list includes long polling-site lines in 2002, 2004, 2006, 2012 and 2016; leaving a medical marijuana ballot initiative off of some voter forms and releasing early vote totals before the polls closed in 2016. The Miami Herald reported that Snipes blamed those errors on vendors hired to perform election-related tasks. Snipes snafus also include a congressional race in which some tallied ballots were destroyed before state law allows. After the election, Snipes and her team took days to count early and absentee ballots, failed to provide the public with tallies of the number and types of ballots which remained to be counted, appeared to misplace some voter forms and mixed about two dozen invalid forms in with ballots to be tallied. Finally, Broward County missed a recount deadline by two minutes. Snipes, like her pastor, the Rev. Dr. Marcus Desmond of New Mt. Olive Baptist Church in Fort Lauderdale, hails from Alabama, home of the Edmund Pettus Bridge, site of a 1965 clash during which state officials beat and seriously injured African-Americans marching for voting rights so severely it is known as "Bloody Sunday." For someone like Snipes, Desmond said, that experience is close, almost intimately understood. Voting is almost sacred. To Anderson, Snipes and other people who work in the nation's election system appear to have become two of the things that Trump loves most, a foil and a useful distraction.